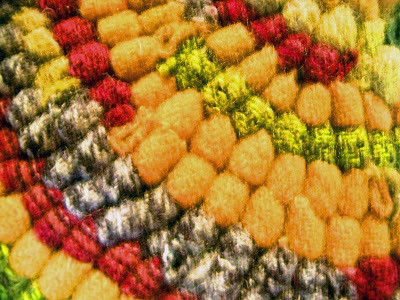 I explained on Yahoo Rughookers what happened to this sad little rug after I posted on this blog that I had finished the hooking. I steamed it, dried it, then put it on the floor under the card table I was using as a work table. My dear dog George used it like a puppy pad. I discovered what had been done when I saw some discoloration of the monk's cloth that I hadn't cut off for binding yet. Later the same day, I had to take George for a visit to his doctor and it turned out that the rug became diagnostic - George has a bladder problem, possibly very serious - so, I couldn't be upset with him, but I was afraid the little rug was ruined. I poured carpet soap full strength on it, then washed it off with cold water, then used a special pet cleaning soap and soaked the rug all over again. I took it outside, put it on a mesh table and rinsed the soap off with the garden hose - talk about mistreatment! Then I left the rug out in the sun for several days. 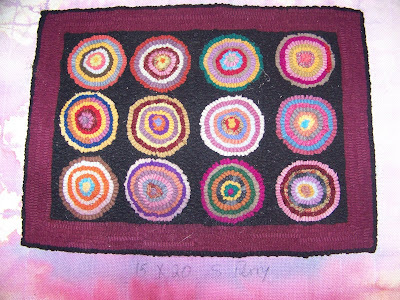 Some color bled out, but the rug dried and the smell disappeared - at least to human noses. I tested the smell factor by placing the rug on the dining room floor again and Patches immediately stepped up to smell exactly the bad spot. 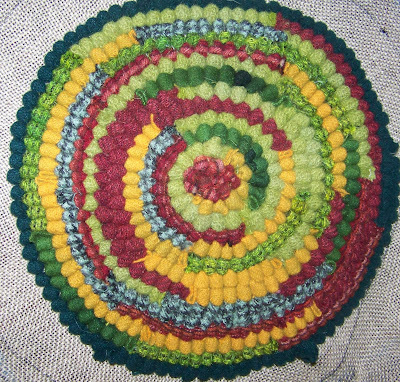 So, this little mat will never again go on the floor and will probably never be a table mat either, but it did help diagnose a health problem for George and it also answered the question about how to wash a hooked rug. I think I should be pleased that it was hooked on monk's cloth and not burlap. This circular mat is hooked with strips one inch wide. After reading the 1930 book by Mary Perkins Taylor, I thought I'd play around with some very wide strips. For some unknown reason, other than it was very late at night, the strips became twice as wide as Ms Taylor suggested. It wasn't easy to pull the strips through the primitive linen, I had to resort to the largest Hartman hook and still had to fold the strips in half. The loops became pretty thick lumps that would make a very stiff and thick mat, maybe useful as a hotpad, but not particularly appealing. I am planning to pull these strips out of the backing, tear them in half, and try again. 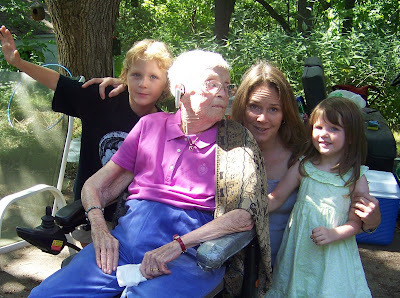 In an earlier post, I showed a photo of my mother with her grandaughter - here she is again with her great-grandchildren. Max, who spent his early years in Kenya, and Zoe who has lived her three years in Guatamala. We were very pleased to have their annual visit home coincide with Grandma's 98th birthday party.